Officials from both schools recently formalized a transfer agreement after laying out groundwork last fall. Graduates who have earned a pre-engineering associate degree in science at Bay can transfer two years of course work into a computer, electrical, or mechanical engineering bachelor-degree tracks when they enroll at Lake State. Students can also complete a concentration in robotics and automation. “Engineering careers are built through hard work, developing strong math and science skills, on top of a broad education. LSSU prides itself in producing engineering graduates who are not only technical experts but also who have hands-on experience and strong communication and analytical skills,” said LSSU President Tom Pleger. 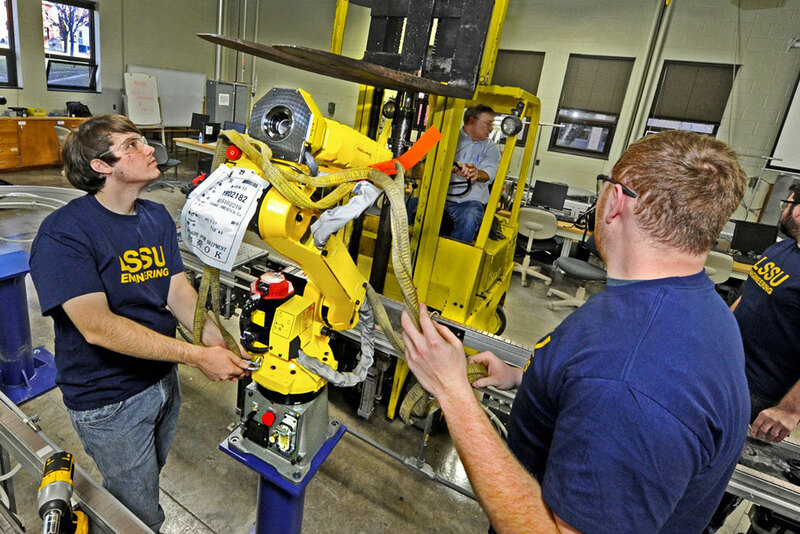 LSSU boasts a 100 percent job placement rate for all of its student engineers within six months after graduation. Matthew Barron, executive dean of arts, sciences and academic support at Bay College, says students can now transfer seamlessly to LSSU to complete a bachelor’s degree. “This is just another example of the strong partnership we have with LSSU,” he said. Bay’s STEM club took a tour of LSSU last fall. Spencer Slade, mathematics instructor at Bay College, said he feels Bay sudents will fit in well at LSSU. “I was impressed with their engineering department and students. A lot of our students will benefit from the personal attention at LSSU and be attracted to the small-town atmosphere that LSSU offers,” Slade said. The new engineering articulation agreement joins a long list of partnerships between Lake Superior State University and Bay College, which also hosts an LSSU regional center. Students can earn baccalaureate degrees in nursing, business, criminal justice, general studies, and early childhood education and nursing, without ever having to leave Bay’s Escanaba main campus or branch center in Iron Mountain. Share the post "Bay College engineering grads can now opt into three LSSU degrees"
Categories: Chippewa County, Delta County, Education, and Featured.